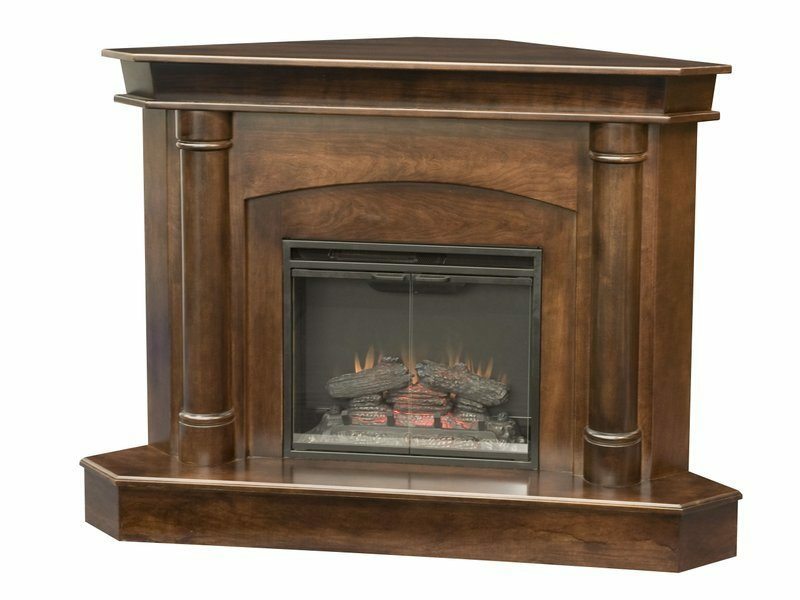 Decked out in brown maple with Expresso finish, the solid hardwood Regal Corner Fireplace adds a classy, sophisticated look to your living room or den. Notice its carved columns, graceful arch and rich, genuine woodgrain. We equipped the Regal Corner Fireplace with a Fire F/X Flame Insert. And it features a solid glass front and six full-functioning flame settings. It also comes with heat on/off control, timer and multi-color flame technology. You also get a full-functioning remote and a 1-year limited parts warranty through the manufacturer. What’s more, the flame insert can heat a 400 sq. ft. area. And there’s more. You can include a TV/DVD player component shelf with or without a flip-down door. In addition, we can install a marble surround. And your choices are Amber, Goldenbrown, Mist or Shasta. 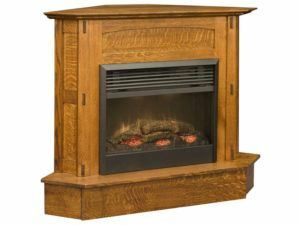 Amish artisans painstakingly handcraft each Regal Corner Fireplace. And they use genuine hardwoods like oak, hickory, cherry or maple. So the fireplace is sturdy and long-lasting. Plus, you can order the unit as shown or unfinished. And we can customize it to fit your needs and desires. 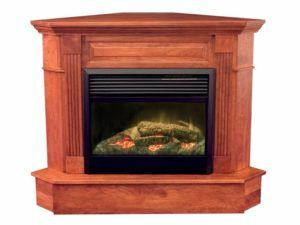 For a quote on the Regal Corner Fireplace, click on the “Custom Options” link, and select the wood specie/finish as well as the other custom options listed. Then, complete the “Request Your Quote” field, where you can tell us your other custom ideas. And if you’re relatively close to Shipshewana, Indiana, visit our store to explore our wide assortment of quality, Amish-built, solid hardwood furniture for yourself.